Cumbria is a large county in North West England and contains the Lake District and Lake District National Park. It is bounded to the north by the Scottish Borders, Dumfries and Galloway, to the west by the Irish Sea, to the south by Lancashire, to the south east by North Yorkshire, and to the east by County Durham and Northumberland. Cumbria is very mountainous containing every peak in England over 3,000ft above sea level with Scafell Pike being England’s highest mountain at 978 meters (3,209 feet). Cumbria is also one of England’s most outstanding areas of natural beauty attracting mountain climbers, hikers and walkers, cyclists, runners and tourists and holds a source of inspiration for artists, writers and musicians. Cumbria consists of six districts Eden, Carlisle, Allerdale, Copeland, South Lakeland and Barrow-in-Furness. The Lake District is an area with stunning scenery located in the North West of England in the County of Cumbria. Commonly known as The Lakes or Lakeland it was granted National Park status on 9th May 1951 less than a month after the first UK designated National Park, The Peak District. It is the largest of thirteen National Parks in England and Wales and the largest in the UK after the Cairngorms. The Lake District National Park itself covers an area of 885 square miles and stretches 30 miles from Ravenglass in the west to Shap in the east and 35 miles from Caldbeck in the north to Lindale in the south. Crammed with so much natural beauty the Lakes attract visitors, tourists and holiday makers from all over the world. As the name suggests there are many lakes each with their own uniqueness, amenities and activities such as lakeside walks, sailing, waterskiing, boat trips and ferries. All of the lakes except Bassenthwaite Lake are named by water, tarn or mere and are surrounded by stunning scenery and magnificent fells. There are some wonderful towns to explore such as Keswick, Windermere, Ambleside, Kendal, Hawkshead, Grasmere and Cockermouth all with a splendid mixture of shops, cafes, pubs, bars and restaurants. 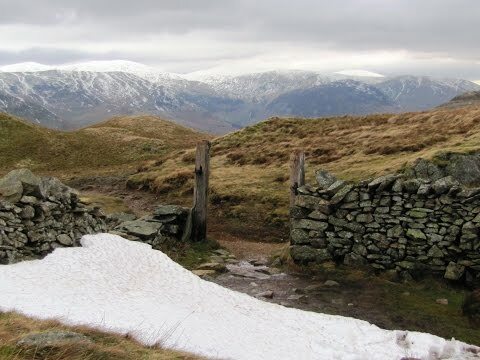 There are also many museums, theatres, historic homes, gardens and many easy walks for the not so energetic visitor wishing not to climb the fells. William Wordsworth the famous British poet was born in Cockermouth and later lived in Grasmere where he wrote some of his best works before moving to Rydal Mount near Ambleside for his last 37 years. Both places are open to visitors and so is Brantwood home to John Ruskin until his death. Samuel Taylor Coleridge, Robert Southey and Thomas de Quincey all followed Wordsworth to the Lake District. Arthur Ransome, author of Swallows and Amazons, also grew to love the lakes and settled in the Winster Valley near Windermere. The painters Thomas Gainsborough, JMW Turner and John Constable were early visitors to the lakes but it was John Ruskin who settled here at Brantwood on the shore of Coniston Water. Farming and especially sheep farming has been historically and still is the main industry of the Lake District with the tough Herdwick breed being most closely associated with the area. Sheep farming is an important factor both to the economy of the lakes as well as in preserving the stunning landscape which attracts visitors and hence income to the region. Hartsop is a small olde worlde end of the road village at the foot of Kirkstone Pass consisting of 17th century grey stone cottages and farm buildings and lies in the Patterdale valley within what was once a royal forest set aside for deer hunting. Red squirrels, badgers, birds and other wildlife are attracted to this peaceful valley. The village was a lead mining community and it still retains its historic image in that it has houses with spinning rooms. The villagers would have made their own clothing and sold any surplus in the local market towns. Hartsop is overlooked by Brook Crags and Hartsop Dodd and is a very popular starting point for hill walkers climbing on the High Street range and the Helvellyn range. Not far from Hartsop is Brothers Water once called Broad Water but was renamed after two brothers drowned there in the 19th century. It may be described as one of the Lake District’s smallest lakes or one of its largest tarns and its shallow water is covered by lily pads creating a green carpet on its blue waters. Nearby is the Brotherswater Inn and Sykeside camping and caravan site. Boredale Hause is a mountain pass between Place Fell and Angle Pikes. It is a grassy area at a confusion of many paths linking the Patterdale and Boredale valleys. Angle Tarn situated between Angletarn Pikes to the north and Brock Crags to the south is a stunning tarn of about a ¼ mile long with an island in the middle. It also sits in a hollow on the centre of the ridge going westwards through the narrow valley of Angle Tarn Beck. Angletarn Pikes takes its name from the two rocky towers at the summit which are separated by a stretch of peaty bog. The northern top is the true summit, the southern top about 2 meters lower offers wonderful clear views of Angle Tarn described by Wainwright as ‘among the best of Lakeland tarns’. Hayeswater is a small and remote lake just over a mile from Hartsop and serves as a reservoir for the town of Penrith about 12 miles away. It is a natural lake and sits at almost 425 meters between The Knott to the west and Gray Crag to the east. The lake is fed from the south by Hayeswater Gill, which rises close to the route of the Roman High Street and continues to Cow Bridge where it joins the outlet stream from Brothers Water. The path leading up to the lake is quite strenuous but well worth it for its beauty. Otters are regular visitors to the lake, Red deer can be seen roaming the slopes above the tarn and golden eagles are quite often sighted. From the car park we head forwards and follow the lane though the village. When we reach the white house and telephone box we turn right and follow the tarmac track which becomes a stony track between two walls. We eventually come to a gate we go through and cross the footbridge on the right then follow the stream on our left. After a short way we cross the stream and keep following the wall on our left. At the fork in the track we turn right uphill and keep heading uphill on the track until we reach Boredale Hause which is a large grassy area with a cairn in the centre, an old sheep fold on the right and Place Fell on the left. From here we bear to the right of the cairn following the path over the stream then uphill. We follow the path over rough stony ground which bears left then right to follow a narrow path with a steep drop on our right. Angletarn Pikes are above us on our left and we can see Brothers Water down below in the distance. The path bears round to the left and we can see Angle Tarn in front of us. We head downhill to the tarn and walk round the far side of the tarn following the path. We keep heading forwards to go through a broken wall and follow the wall on our right. We turn right through the wall and head downhill following the fence line. We then bear slightly left to cross over a stream then uphill again for a short way before turning right downhill to the head of Hayeswater. We cross over the bridge and turn right following the track downhill with Hayeswater Gill on our right. We pass an old building then cross over the bridge and follow the track on the other side of the gill downhill back to Hartsop. This is a moderate to hard walk with steep inclines and declines on good tracks, stony tracks and some rough ground. Approx 6.25 miles allow 3 hours using OS Explorer Map OL5, The English Lakes North-eastern area. Start point: Car parking area at the very end of Hartsop Village. Hartsop is in the valley of Patterdale in the Lake District. From the A66 at Troutbeck take the A5091 sign posted Ullswater. Follow the A5091 until it joins the A592, on the edge of Ullswater, turn right and follow the road through Glenridding and Patterdale. Hartsop is about 2 miles further on, on the left. Parking: Car parking area at the very end of the Hartsop village and there is also a car park at Cow Bridge on the A592 towards Patterdale. Both are free. There are no public toilets, shops or pubs in Hartsop. There is the Brotherswater Inn down the road just past Brothers Water. The next nearest facilities are at Patterdale, Glenridding and Ambleside.